The Cuisinart 722-30HNS chef's classic 12 in. open skillet is ideal to sauté mushrooms or brown sausages to perfection. It has exterior 18/10 stainless-steel construction and Quantanium and non stick interior, ideal for healthy cooking and low fat diets. The skillet includes an inner core of aluminum to ensure foods heat quickly and evenly. The cookware's riveted stainless-steel handle stays cool on the stovetop, while its lid seals in moisture and nutrients for healthier, more flavorful results. The 12 Non-Stick Open Skillet W/Hh Chef Classic Stainless has many exciting features for users of all types. You can extend the lifetime of your 12 Non-Stick Open Skillet W/Hh Chef Classic Stainless with the purchase of a FactoryOutletStore Factory Protection Plan. 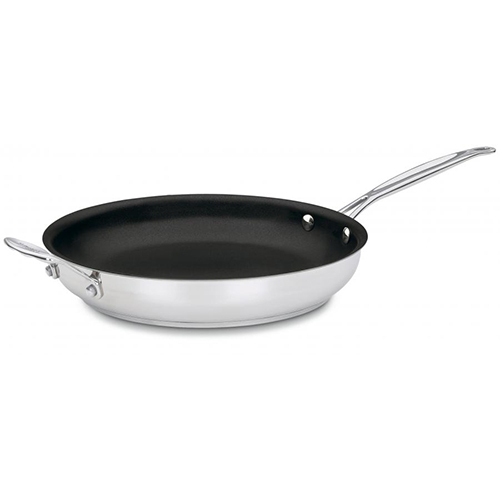 See the 12 Non-Stick Open Skillet W/Hh Chef Classic Stainless gallery images above for more product views. 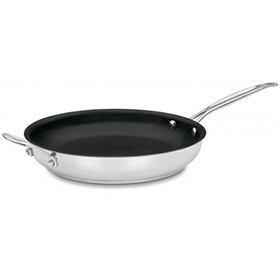 The 12 Non-Stick Open Skillet W/Hh Chef Classic Stainless is sold as a Brand New Unopened Item.